April 12th marks the anniversary of the first United States Postal Service “Forever Stamp”. 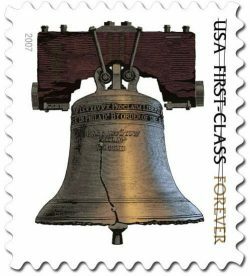 The first Forever Stamp in the US went on sale on April 12, 2007 featuring the Liberty Bell and sold for 41 cents. Forever Stamps can be used to mail a one-once letter regardless of when the stamps were purchased no matter how postage prices change in the future. Forever Stamps are always sold at the same price as a regular first-class mail stamp. The USPS applied to begin developing the Forever Stamp program in 2006, it was a concept similar to the United Kingdom’s practice of issuing non-denominated stamps. The Liberty Bell design was the only Forever Stamp in circulation until October 2010 when the second design was released featuring pine cones and evergreen trees. All first-class stamps became Forever Stamps in 2011, with the exception of coils of 500, 3,000 and 10,000. In 2015 the USPS expanded the concept to incorporate several other categories including postcard, additional once, and two and three once stamps.